Plants employ a wide variety of tactics to lure pollinators, but an ornamental plant popularly known as Giant Ceropegia takes it to another level. Its flower smells like a honeybee under attack—an odor that freeloading, meal-seeking flies find absolutely irresistible. Around four to six percent of all plants use deception to attract pollinating insects, but researchers have never seen a trick like this before. Writing in the latest edition of Current Biology, researchers from the University of Salzburg in Austria and the University of Bayreuth in Germany describe the unique strategy employed by the Giant Ceropegia, a plant with an umbrella-like flower that it uses to temporarily imprison pollinating insects. 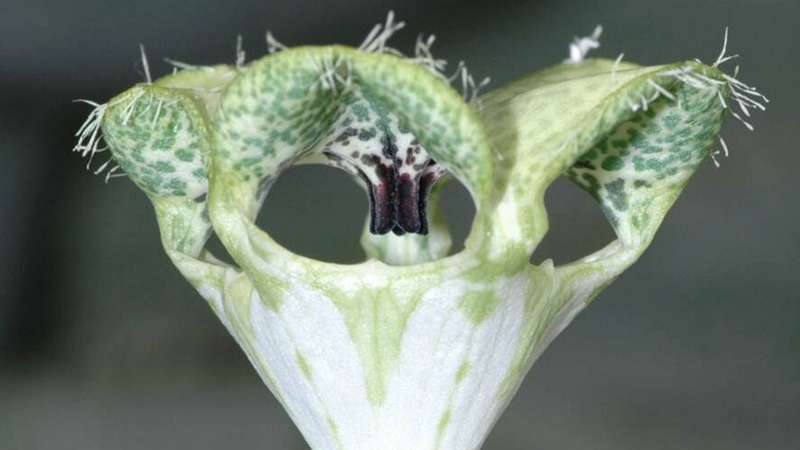 Evolutionary biologist and entomologist Stefan Dötterl and his colleagues show that the trap flower on the Giant Ceropegia smells like a bee under attack. But why, you ask, would a flower want to emit such a distinctive scent? Well, it turns out that this particular aroma attracts parasitic flies—and it tricks them into pollinating the flower. The flies are drawn to the smell because they like to feast on the remains of honeybees who have been killed by a spider or a predatory insect. The Giant Ceropegia has evolved an ingenious way to attract and temporarily capture a bug that thinks it’s there to steal some food. When an unwary fly ventures inside the flower, the trap closes shut, enclosing the fly inside. The fly struggles for a bit, pollinating the plant in the process. Eventually, the flower opens up and the fly is free to move on. “Flies are attracted to the flowers, expecting a meal, but instead of finding an attacked honeybee they are temporarily trapped in the non-rewarding flowers [there’s no food inside!] and misused as pollinators,” explains Dötterl in a release. The researchers say it’s the first example of a plant that achieves pollination by pretending to smell like a carnivorous animal’s dinner. The researchers made the discovery while trying to figure out how the flies, a species known as Desmometopa, were so good at finding honeybees so soon after a spider attack. While observing one such encounter, study co-authors Annemarie Heiduk and Ulrich Meve from the University of Bayreuth noticed that the bees released a shot of venom. This complex compound contains “alarm” pheromones that call and attract nest mates for help. Flies have learned to recognize this smell, and react accordingly. Studies done in the lab show that the Giant Ceropegia’s flower smells almost exactly like the compounds excreted by bees who are under attack. So this plant, through the extraordinary powers of Darwinian natural selection, has evolved a highly specialized technique for attracting flies and boosting its reproductive potential. Looking ahead, the researchers are hoping to see if other plants employ a similar strategy.